The term Navajo Wars covers at least three distinct periods of conflict in the American West: the Navajo against the Spanish (late 1500s through early 1820s); the Navajo against the Mexican government (1821 through 1848); and the Navajo against the United States (after the 1847-48 Mexican-American War). These conflicts ranged from small-scale raiding to large expeditions mounted by governments into territory controlled by the Navajo. The Navajo Wars also encompass the widespread raiding that took place throughout the period; the Navajo raided other tribes and nearby settlements, who in return raided into Navajo territory, creating a cycle of raiding that perpetuated the conflict. Facundo Melgares, the last Spanish governor of New Mexico before independence in 1821, conducted two unsuccessful expeditions against the Navajos, who were attacking the New Mexican settlers. In October 1821 he sued for peace. 1582: Espejo-Beltrain "found here peaceful Indian mountaineers" called Querechos. This party did not linger around Acoma because the Querechose who carried on trade with the Pueblo were known to come to their aid in times of conflict. 1630: Fray Benevides arranges a peace between the Tewas and Navajo. 1638: Governor Luis de Rosa encourages Navajos to raid the missions of his political enemy the Franciscan friars. 1641–42: Franciscan friars mount a military campaign against Navajo, burning corn, taking prisoners and killing some. 1644–47: Spanish fight Navajos living along the San Juan River. 1659: Bernardo Lopez sends 40 Spanish soldiers and 800 allies into Navajo land. 1661: Lopez sanctions killing and capture of Navajos as slaves who came to Tewa to trade. 1669: Spanish attack Navajos near Acoma. 1677–78: Navajos actively raiding Spanish pueblos. Spanish mount three different scorched earth and slave gathering campaigns. 1680: Navajos probably join Pueblos. Start of Great Southwestern Revolt against Spanish. 1691: Navajos alert Pueblos and Apaches that Spanish force was on its way. 1696: Navajos said to be inciting other tribes, combined with Texas in revolt. 1698–1699: End of Great Southwestern Revolt; Spanish boundaries remain constant. Melgares's successor, Governor José Antonio Vizcarra met Navajo leaders at Paguate on 12 February 1823. His terms essentially stated that the Spanish would settle the Navajos in pueblos and energetically convert them to the Catholic religion. The Navajos were not interested in either of these proposals. They rejected the treaty and renewed the fight. Six New Mexicans were killed at Socorro in April and eight more at Sabinal in May. On 18 June 1823, Vizcarra led 1,500 troops in a 74-day expedition against the Navajos of western New Mexico. His route took him through the Chuska Mountains to the Hopi mesas in what is now Arizona, then north towards Utah, reaching Oljeto Creek in what is now San Juan County, Utah. Thirty three Navajos were killed, of whom eight were women, and about 30 were captured. The expedition reached Canyon de Chelly in what is now eastern Arizona. In retaliation for Vizcarra's expedition, the Navajos raied Socorro again, and attacked Tome, Albuquerque and reached the outskirts of Santa Fe. The 1823 raid marked the start of a long period of raids and counter raids lasting until 1848 as New Mexicans took Navajos captive to work as slaves, and as Navajos raided to recover their people and to obtain livestock. June 1822: Massacre of Navajo tribal leaders at Jemez Pueblo followed by extensive Navajo raids. June 1823: José Antonio Vizcarra begins extensive punitive expedition. The U.S. military assumed nominal control of the southwest from Mexico by 1846. Military and civilian records show that civilians continued their raids into Navajo lands. Likewise, Navajo raided these same civilians. Slavery, the Civil War and civilian militias complicated the U.S. military response to the Navajo until the mid-1860s, which culminated in the Long Walk. 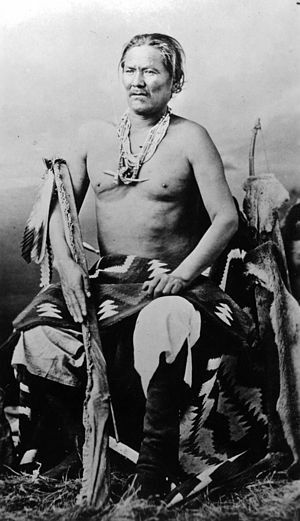 1846: Following an invitation from a small party of American soldiers under the command of Captain John Reid who journeyed deep into Navajo country and contacted him, Narbona and other Navajos negotiated a treaty of peace with Colonel Alexander Doniphan on November 21, 1846 at Bear Springs, Ojo del Oso (later the site of Fort Wingate). The treaty was not honored by young Navajo raiders who continued to steal stock from New Mexican villages and herders. 1849: The military governor of New Mexico, Colonel John Macrae Washington, accompanied by John S. Calhoun, Indian agent, led a force of 400 into Navajo county, penetrating Canyon de Chelly, and there signed a treaty with two Navajo leaders acknowledging the jurisdiction of the United States and allowing forts and trading posts in Navajo land. The United States, on its part promised "such donations [and] such other liberal and humane measures, as [it] may deem meet and proper". 1851: Col. Edwin Sumner starts his campaign against the Navajo and delegates Maj. Electus Backus to build Fort Defiance in the middle of Diné bikéyah (Navajo territory). Col Sumner enters Canyon de Chelly but Navajo harassment attacks cause him to withdraw. 1855: A treaty is signed at Laguna Negra by Manuelito and Zarcillos Largos for the Navajo and Henry Linn Dodge (Indian agent), Governor Merriweather, and General John Garland. 1857: Severe drought hits the Navajo and decimates their livestock and agricultural resources. This is a time of social disruption as surrounding tribes gradually increase their attacks on the weakened Navajo. The winter of 1857-58 is a time of famine. 1858: Navajo demand that Fort Defiance stop grazing their livestock on prime Navajo land. Soldiers shoot 48 cattle and 8 horses belonging to Manuelito. A servant of the commanding officer is killed in retaliation for no compensation of killed livestock. The military demands the murder be brought to them, otherwise war would ensue. The Miles Campaign starts September 9 at 0800 from Ft. Defiance. 1860: U.S. military, Mexican-Americans, Zunis, and Utes all raid Navajo land. January: Navajo kill four soldiers from Fort Defiance. April: Manuelito, Barboncito and 1,000 Navajo attack Ft. Defiance. Others raid sheep and mules near Santa Fe. May–October: 400 New Mexicans under Manuel Antonio Chaves form a militia and raid Navajo land, followed by independent raids by citizens for captives. Canby Campaign starts in early October in retaliation for attack on Ft. Defiance. September–December: Seven army expeditions kill 23 Navajo. 1861: Civil War causes the Union troops to abandon forts and head east. February: Another treaty is signed at Fort Fauntleroy (later Fort Wingate). Ft. Defiance decommissioned Feb. 24th. February: General Edward Canby says 31 citizens from Taos arrive at Fort with captive Navajos (taken from them by Canby) and need of rations. March: Canby reports four more citizen groups have attacked Navajos for captives. August: Manuel Antonio Chaves of the New Mexico Volunteers orders his command to open fire on gathered Navajos after a dispute arose from allegations of cheating at a horse race between Navajos & New Mexican Volunteers forces at Fort Wingate. Treaty signed in February is broken and Navajos resume attacks. 1862: Confederate forces push up the Rio Grande, and raids on Navajos by civilians increase. 1862: Union forces, of the Colorado Volunteers, assisted by some New Mexican Volunteer militia units, push the Confederate forces back to Texas. With the arrival of the California Volunteers under the command of General James H. Carleton, Fort Wingate is re-established at Ojo del Oso (formerly Fauntleroy). Citizens state Navajos and Apaches stole 30,000 sheep in 1862. 1863: Navajos are continually raided by militia. July: The New Mexico District Military Governor, General James Henry Carleton, tells 18 Navajo chiefs that they must surrender by July 20, 1863, and move to Fort Sumner, at the Bosque Redondo. July: Under orders from Gen. Carleton, Col. Kit Carson starts his simultaneous campaign against the Mescelaro Apache and Navajo. September: Carson is ordered to direct four companies of New Mexican Volunteer Militia at Fort Wingate against the Navajo. Carson's first priority is to defeat the Mescalero Apache, then afterwards the Navajo. October: General Carleton establishes Bosque Redondo and the defeated Mescalero Apaches are sent there first in December. Between September 1863 and January 1864, Carson and his men chased the Navajo, killing and capturing a few. Crops were burned, stock was confiscated, hogans were burned. Some of Carson's men marched through Canyon de Chelly destroying Navajo property. Without food or shelter to sustain them through the winters, and continuously chased by the U.S. Army, groups of Navajo began to surrender. **Those of the Navajo warriors who did not surrender joined renegade Apache bands and continued to battle the U.S. and Mexican governments through the 1880s. "By slow stages we traveled eastward by present Gallup and Chusbbito, Bear Spring, which is now called Fort Wingate. You ask how they treated us? If there was room the soldiers put the women and children on the wagons. Some even let them ride behind them on their horses. I have never been able to understand a people who killed you one day and on the next played with your children...?" —Very Slim Man, Navajo elder, quoted by Richard Van Valkenburgh, Desert Magazine, April 1946, p. 23. ↑ 1.0 1.1 1.2 1.3 Locke, Raymond Friday (2002-03-01). The Book of the Navajo. Holloway House Publishing. pp. 190–191. ISBN 978-0-87687-500-1. http://books.google.com/books?id=Z8e2mfFJa-4C&pg=PA190. Retrieved 2012-07-15. ↑ McPherson, Robert S. (2003-01-01). Navajo Land, Navajo Culture: The Utah Experience in the Twentieth Century. University of Oklahoma Press. pp. 9–10. ISBN 978-0-8061-3410-9. http://books.google.com/books?id=r7dLl1TfOgEC&pg=PA9. Retrieved 2012-07-15. ↑ Bullis, Don (2008). "New Mexico: A Biographical Dictionary 1540–1980". Rio Grande Books. http://nmsantos.com/Statehood/Timeline/Timeline.html. Retrieved 2012-07-15. ↑ Griffin-Pierce, Trudy (2010-06-30). The Columbia Guide to American Indians of the Southwest. Columbia University Press. p. 58. ISBN 978-0-231-12790-5. http://books.google.com/books?id=XCvXZKFqZy8C&pg=PA58. Retrieved 2012-07-15. ↑ "Navajo Timeline 1821-1847". Lapahie.com. http://www.lapahie.com/Timeline_Mexican_1821_1847.cfm. Retrieved 30 August 2010. Forbes, Jack D. (1960). Apache, Navaho and Spaniard. Norman, OK: University of Oklahoma Press. LCCCN 60-13480. Kelly, Lawrence. Navajo Roundup. Colorado: Pruett Pub. Co., 1970. Lavender, David. The Rockies, Revised Edition. New York: Harper & Row, 1975. Limerick, Patricia Nelson. The Legacy of Conquest: The Unbroken Past of the American West. New York: W. W. Norton, 1987. McNitt, Frank. Navajo Wars. University of New Mexico, 1972. Thompson, Gerald (1976). The Army and the Navajo: The Bosque Redondo Reservation Experiment 1863–1868. Tucson, Arizona: The University of Arizona Press. ISBN 0-8165-0495-4. Williams, Albert N. Rocky Mountain Country. New York: Duell, Sloan & Pearce, 1950. Yenne, Bill. Indian Wars: The Campaign for the American West. Yardley: Westholme, 2005.